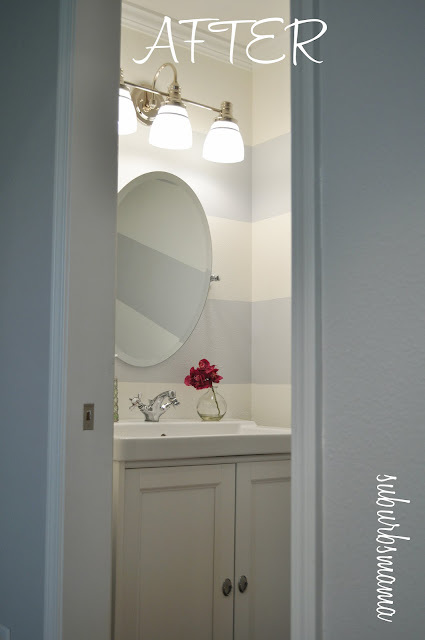 Suburbs Mama: I painted the half bath... AGAIN! And since the day I painted the bathroom, it has been bothering me. So I finally decided to do something about it. It was a challenge, the reason for that is because while I was painting over the stenciling. My little man dumped the bucket of paint all over the hard wood floor! So I cleaned everything up, put the kids to bed and stayed up till 2 in the morning measuring and taping the stripes. Sherry from Young House Love did a post about how to determine how many and how wide to make your stripes, which was very helpful. I did three coats of paint, the next morning. 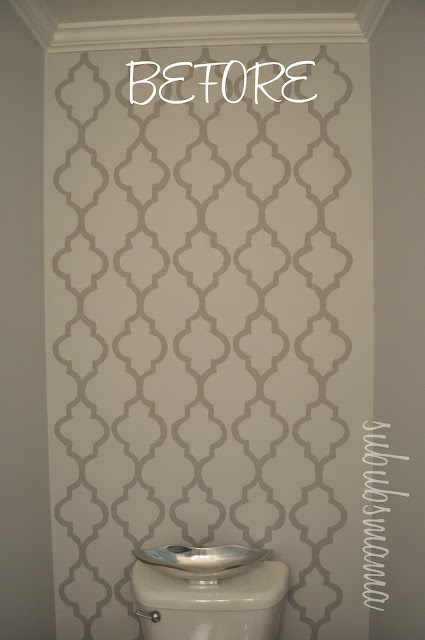 I used leftover paint and tape, so this project did not cost me anything but some time. 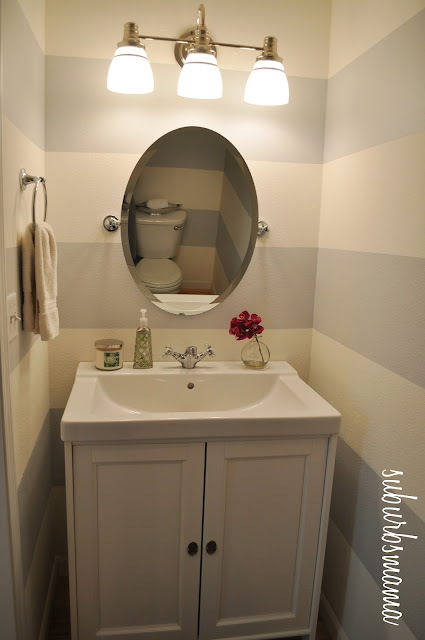 But now I am finally happy with how this half bath looks. It looks fantastic! We are in the process of painting our half bath at the moment. Trying to sneak it in during naptimes and after bedtime. It won't be near as impressive as yours, but I can't wait for it to be done. Very cute! I find 1/2 bath's tricky. I think I painted mine 3 times before I settled on what I liked--and now we will move to a new house and I can start again. Very nice! I like the horizontal stripes, makes the space seem bigger. Great job! That's exactly what my hubby said. He said it seems bigger. 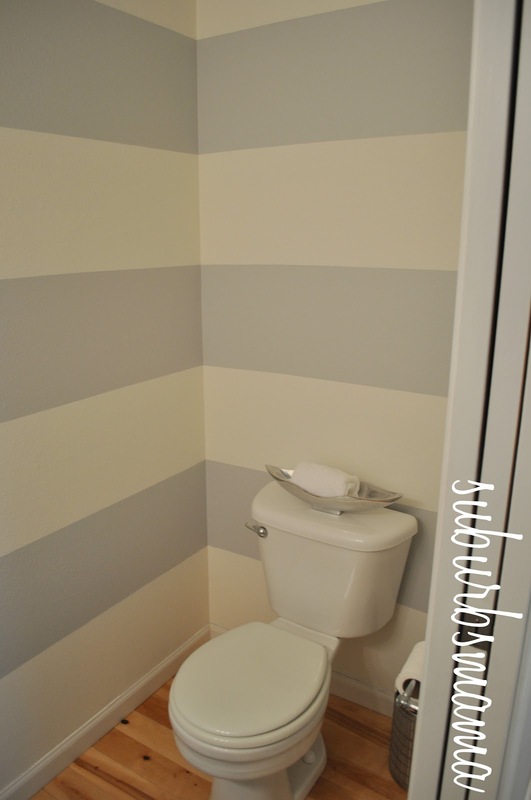 I liked the stencil...but I LOVE the stripes!! Nice work!! So pretty, i love it! i wish i had the patience for something like that. Hey!! I am visiting from the take a look party! I love the strips! 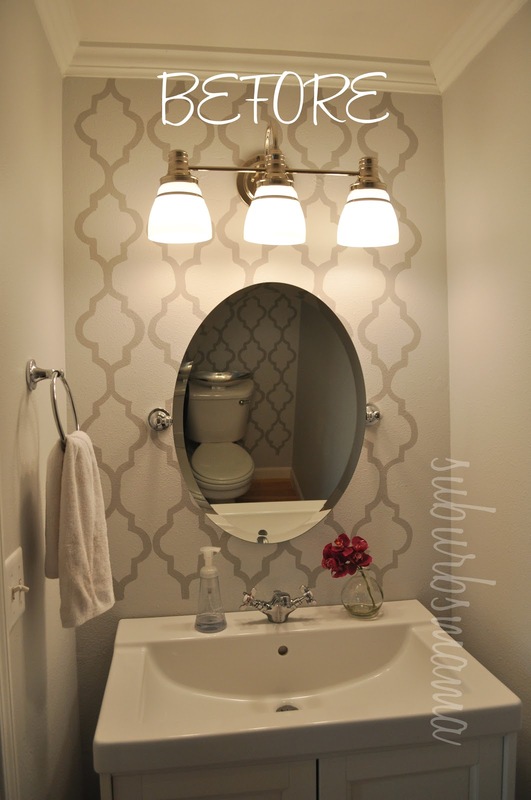 I want to attempt this look in some room in my house, I just dontk now which one!! It looks very open and airy and modern! !